The April flower event went off smoothly with my wonderful volunteers picking up the flower donations at Traders and getting them in buckets of water. Since I am watching my granddaughter this year and cannot pick up the flowers everyday from Traders everyone has stepped up to the plate to make our events happen. Barbara was the leader and ran the show that Friday 27 April. We had 13 volunteers creating the most beautiful arrangements and the flowers from Traders were so exquisite. All the extra flower arrangements went to Fisher House! Yahoo! Thanks so much for bringing a breath of "Spring" to Aleethia's Friday Night Dinner after such a long Winter. The floral arrangements that the Freedom Petals volunteer designed were so beautiful and everyone was so excited to take an arrangement back to the hospital/Fisher House. Besides brightening the room and bringing smiles, I believe in the healing powers that flowers provide....No matter what you are feeling at the time...flowers bring a moment of comfort, uplift one's spirits and so much more. 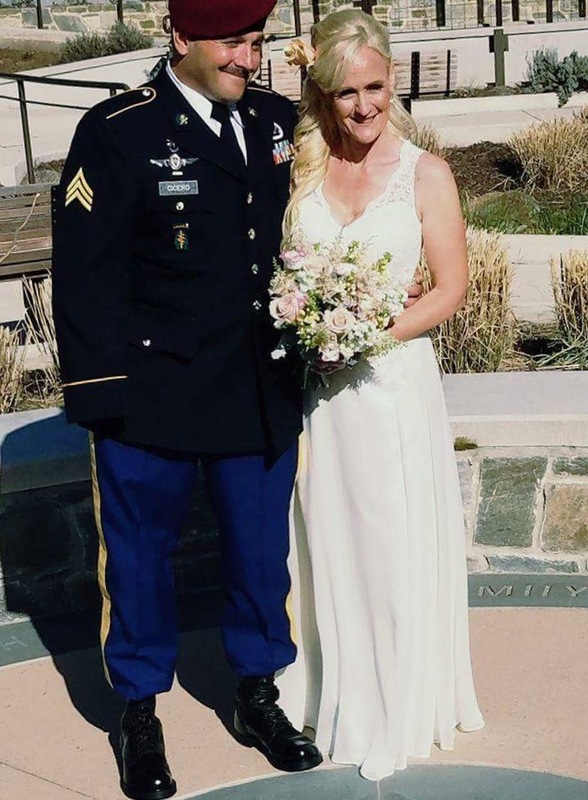 We greatly appreciate the continuous support of "Freedom Petals" and being part of the Aleethia's family and part of the healing/recovery process of the wounded/injured/ill service members. Also, thanks to you and Barbara for helping with the birthday cakes and so much more! We started back with a very successful January flower event to support the Aleethia Dinner at the Capital Hill Club. 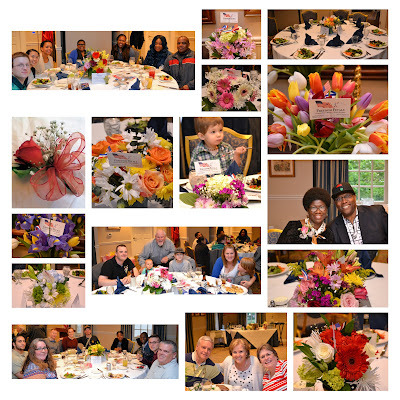 Another year begins with a room filled with smiles and flowers for the Aleethia Foundation's "Friday Night Dinner" held on January 19, 2018. 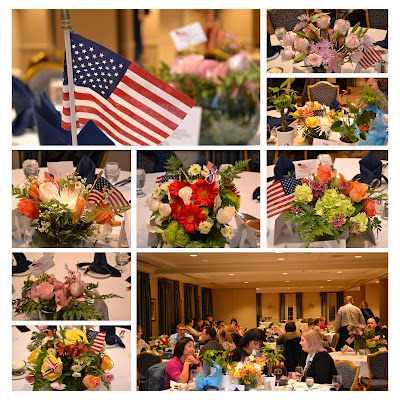 The "Freedom Petals" volunteers provided outstanding floral designs for each table. An added surprise was the array of potted plants including miniature daffodils, anthurium, clyclamen and the "money tree" plants that provided such enthusiasm throughout the room as folks selected a plant to take back with them. 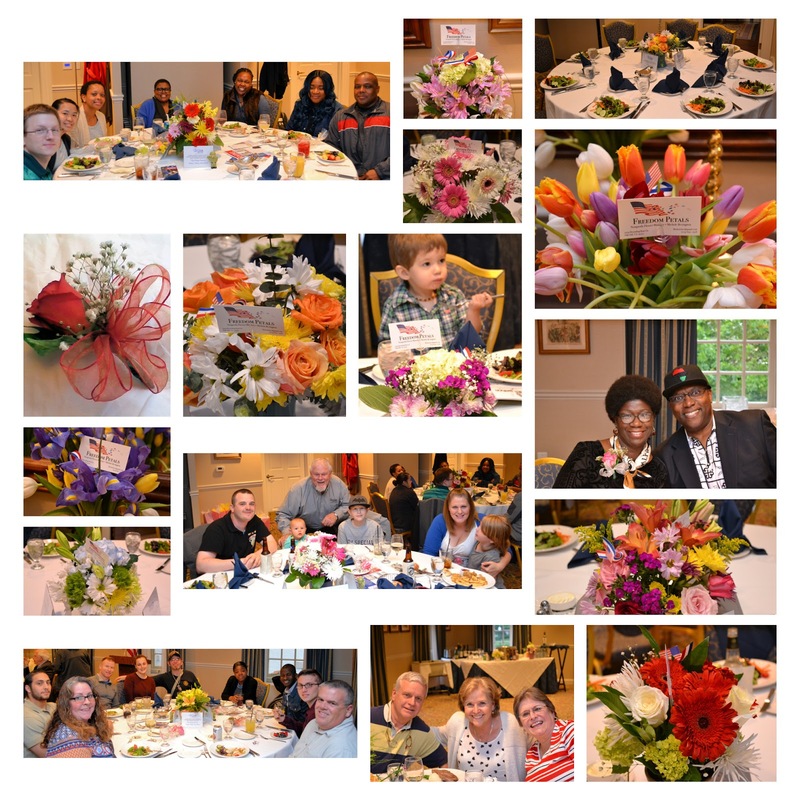 Several caregivers volunteered to assist with bringing the extra floral arrangements and plants back to the Walter Reed patients who were unable to attend the dinner and to the Fisher Houses on base where their families are staying during their healing and rehabilitation. It's no secret that flowers can boost morale, improve moods and bring healing energy. Thanks so much for "Freedom Petals" continuing their mission to bring smiles and caring to the wounded/injured/ill service members and their families who attend the Aleethia Foundation's Friday Night Dinners. was only made possible because of you, the Freedom Petals volunteers. Thank-you, Thank-you, Thank-you for your time, friendship, and creativity. The end of 2017 was a huge success, October was our last flower event. Happy Halloween flowers were shared at the Aleethia dinner. Lots of spiders, pumpkins and scarecrows. November was a very successful speaking engagement at the Annapolis Naval Academy garden club. Marilyn and I helped the members make special bedside mugs filled with fall flowers for a local veteran home. This past fall I began my next chapter in life, watching my new beautiful funny granddaughter, Miss Avery. She is such a joy. With that said I will need lots more support from all of you to keep this mission going for another year. Our next flower event will be Friday, January 19th, creating flower arrangements for an Aleethia Foundation warrior dinner. I will pick up flowers at Trader Joes Monday morning 15 January and Friday, 19 January. But I need help picking up the flowers on Tuesday, Wednesday and Thursday (16 through 18 January). They need to be brought back to my garage, put in buckets and then put in the florist cooler. I know a few of you know this drill..... as you may have picked them up before. We supported the Hoedown for Boulder Crest Retreat on June 3, 2017. 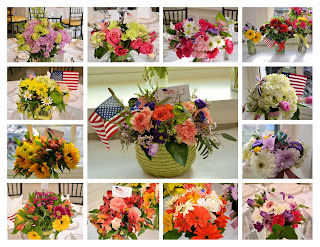 Freedom Petals created beautiful flower arrangements for each dinning table and end tables throughout the main building. Our volunteers also made arrangements for each cabin. Our arrangements for the tables were in cowboy boots vases with western/field flowers that sat in the middle of each table. Everyone was so excited and pleased with the motif and said that they were so appropriate for the occasion. Freedom Petals also made a beautiful and huge arrangement for the Silent Auction. As people walked by the arrangement we heard many compliments and "I want that" from people signing up for the auction that we were very excited that it was bringing in another donation. I just want to mention that the weather was beautiful and the grounds were well decorated for the event by many volunteers. Finally, the event brought in $135,000 for Boulder Crest Retreat and we all had a great time. Thank you and all the wonderful volunteers of Freedom Petals who designed and provided beautiful corsages and floral arrangements to help celebrate Military Spouse Appreciation Day and Mother's Day Weekend at Aleethia's May 12 "Friday Night Dinners." The ladies throughout the room were excited to receive the corsages and some of the men asked me for a corsage to take back to their nurses (since it was the last day of "Nurses Week") or for their Moms. I'm attaching a photo of scenes of "smiling faces!" Also, the four hydrangea plants found four different homes. One is making its way to a service member's family in Fort Eustis in Virgnia Beach. Again, thank you for helping us to honor Moms, Spouses, Nurses, a newly married couple and a "newly" engaged couple with an array of flowers. It was quite an exciting evening for all! 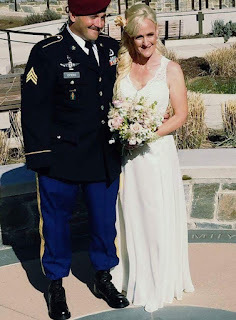 Freedom Petals Inc. and The Herndon Florist provided beautiful flowers for a special couple at Walter Reed this month. We were so excited to help Rick and Lynn with their wedding flowers.